Stems seem to be the new trend just lately. For years we have seen sample packs, develop from very basic multi samples and one shots, to loops, presets, construction kits and templates, the quality ever raising and the genres becoming more widespread and specific. I’m sure you are all familiar with Zenhiser, we are, and as you know they are one of our favourite soundware labels out there, and just recently they dropped Hybrid Trap Stems on our desk and asked for our thoughts. Being kind folk we of course obliged. 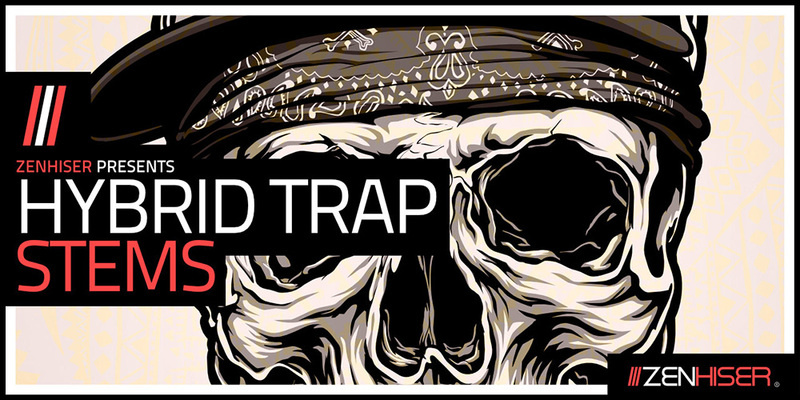 Hybrid Trap Stems is not your ordinary pack of loops and shots, this pack contains, as you may have guessed track stems. In this pack Zenhiser have included a massive 100 Full Song Stems over 10 track projects, BPM’s vary from 80bpm – 150bpm, all (as usual) 100% royalty free and pristine 24-bit WAV files. We were blown away with the quality of these stems and indeed the tracks too. Grabbing a set of stems and dragging them into your DAW is a great way of looking at the individual elements that make up a track and certainly helps for those stuck with arrangement. The stems also offer some great inspiration with their bleeding edge trap riddims. They are also highly useable in your projects to give you a head start. This is a pack we highly recommend you check out if you are into your trap genre, and with the onset of more stem packs from Zenhiser this could be a great companion to your standard sample packs. Our first look inside a stem pack from Zenhiser and were pleasantly surprised by the originality that stem packs can offer in way of learning, inspiration and usability. This stems pack goes above and beyond even Zenhiser's quality and raises the bar even further. Massive thumbs up from us.